London: New York: Maurice Inman; London: Maggs Bros , 1932 Book. Good. Hardcover. Signed by Author(s). 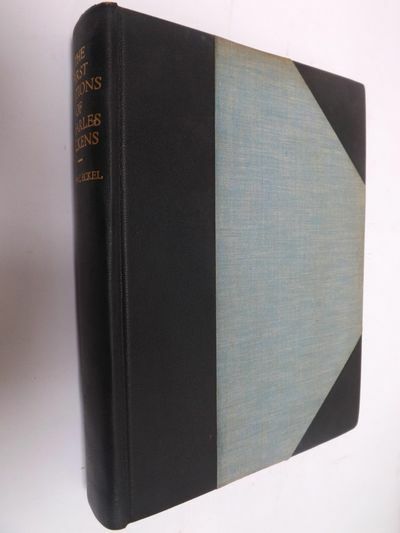 1932, Good Condition, Three-Quarter Leather, Cloth Boards, Top Edge Gilt,Hardcover + Dustjacket, Limited Edition Nr 161 of 250, Signed by The Author, 272pp + Illustrations One of 250 numbered copies of a special edition on rag paper in a large paper format that were signed by the author. NOTES ON CONDITION Good Condition Dustjacket discoloured: see photo's Excerpt from The First Editions of the Writings of Charles Dickens and Their Values: A Bibliography Nearly every collector of fine and rare books includes Dickens among his list of esteemed authors. As it has been written before, Dickens is essentially a collector's author, for the reason that his books in their original state make an irresistible appeal. To tell of the appearance of these is the purpose of this Bibliography. Due notice has been taken of the various issues of first editions, and the different points involved have been carefully assembled and explained. For the first time illustrations have been used in a Dickens bibliography to make clear such points as require them. .